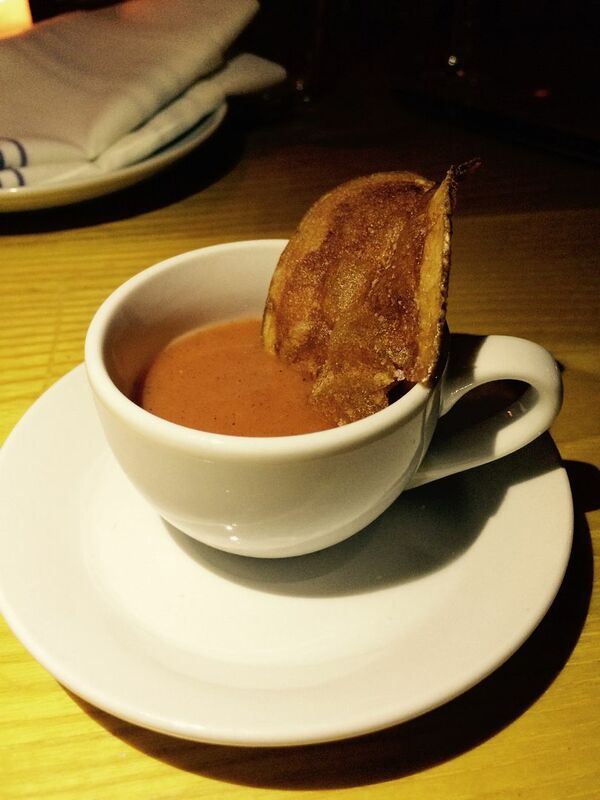 A savory soup amuse sits with a feather of potato crisp in a doll-size teacup. 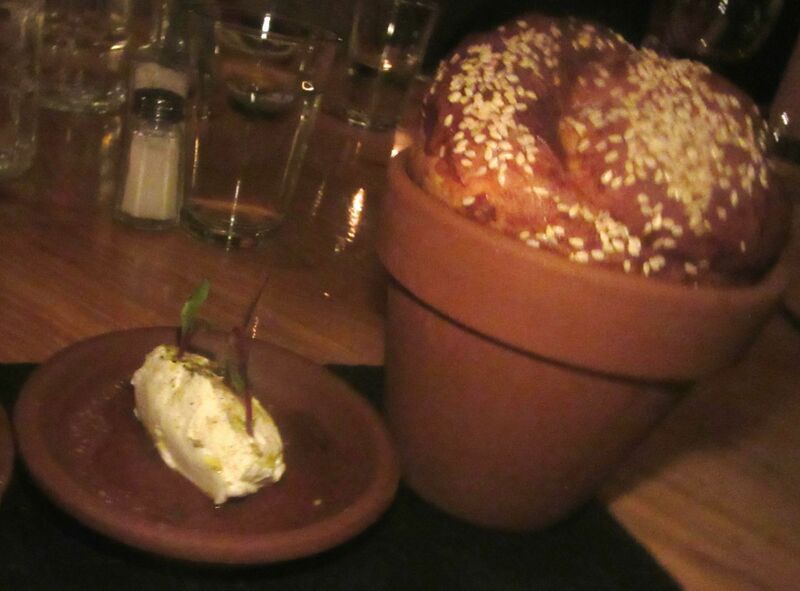 The kubaneh bread, a Yemenite yeast dough, arrives ballooning up in a clay flower pot with sesame seeds sprinkled on top. It lands near me and without hesitation, I appropriate the fattest twist. It’s warm, soft, a little sweet, something between challah and a Parker House roll. There’s a small saucer alongside of crushed tomatoes that turns out to be definitely superfluous. Reluctantly, I pass the bread on, turning to sip the savory soup amuse that sits with a feather of potato crisp in a doll-size teacup. I don’t mind $7 (twice) for this luscious warm bread which scarcely needs its labaneh or tomato sauce. Our ethnic junkie adventure crew hasn’t met for a while and it’s me who picked Timna for our late summer reunion. 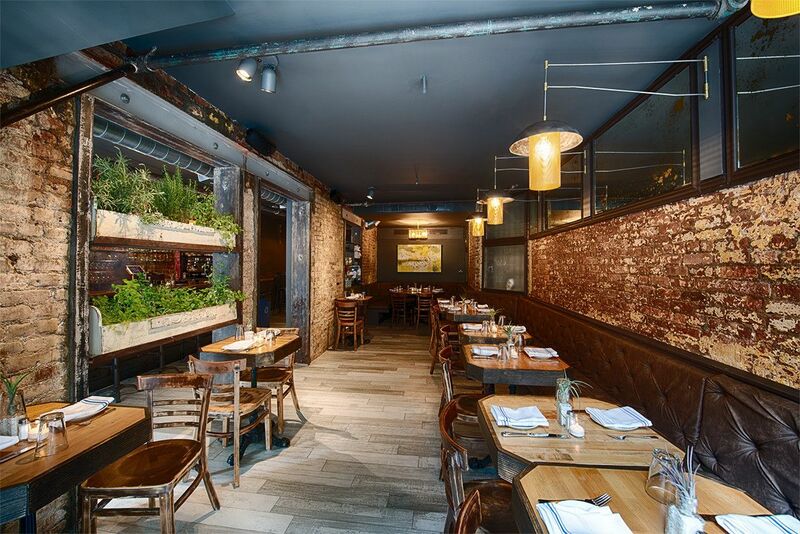 I am eager to explore it, even though it’s all the way past the most intense madness of St. Mark’s Place and I’ve never heard of Chef Nir Mesika or his cooking at Zizi Limona or hummus-chain owner Ori Apple or Amir Nathan, general manager of Antibes Bistro, the trio of partners. The advance blurb said Israeli. I had so quickly fallen for the Israeli chow at Bustan on the Upper West Side that I’m willing to invest $60 in a round-trip taxi venture to Alphabet City. In the dark, in the crowd, you don’t get the sense of the back room but here it is, our round in the rear. Timna is a city in Yemen and a desert valley in Israel (I googled it). The valley is what it’s meant to evoke here. Rich Sander, the serial linguist Ethno Junkie of our crew, points out to me that the symbols under the block letters TIMNA on the menu would be pronunciation helpers in Hebrew. Well, of course I am impressed. I nod wisely and sip my surprisingly appealing, painfully slow-arriving “Negronish.” The house license only allows wine and beer-fortified cocktails. The kitchen can be slow too. 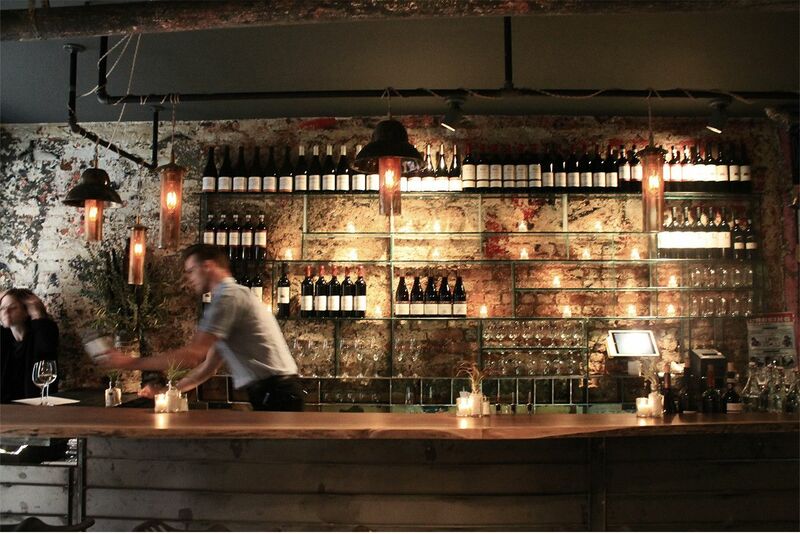 I almost trip on an unseen step, then sail past this bar to join my pals under a six-sided star chandelier. We’re sharing everything – the modus operandi of these expeditions. I have to ask for serving spoons, as I almost always do, even though it’s clear we’re sharing. 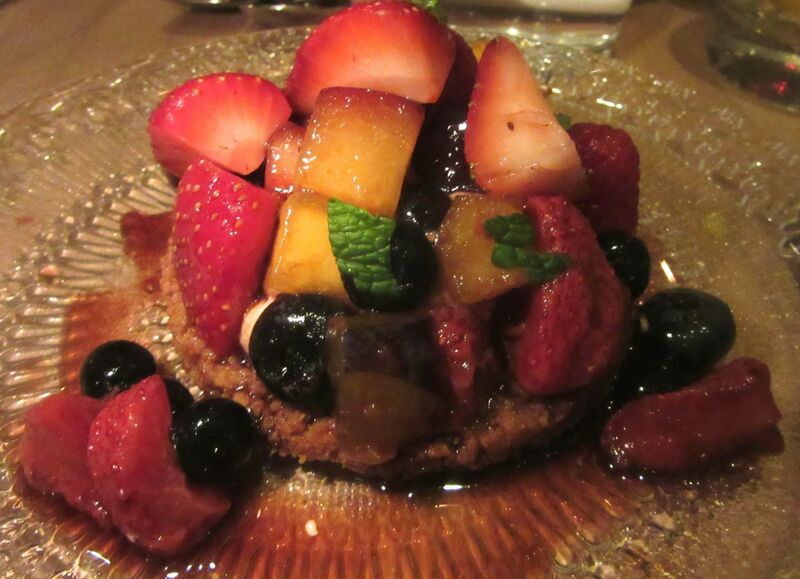 Nothing looks anything like the more classic Middle Eastern dishes at Bustan. 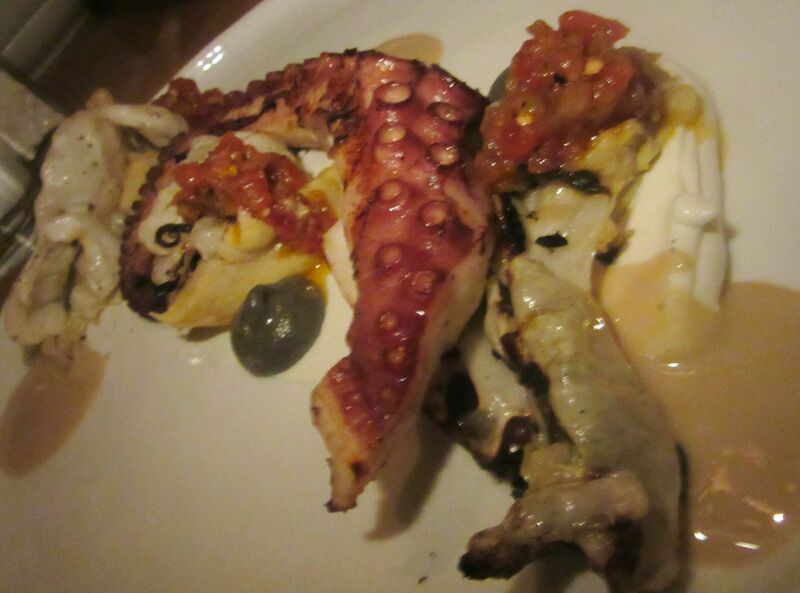 My friends know I’m bored with octopus but they order it anyway. This one was exceptional. Surprisingly, the only hummus I spot is under the curls of charcoal-grilled “Bedouin octopus,” topped with tomato relish and dabbed with black eggplant purée alongside Greek yogurt. Much ado and very good -- the critter tender and smoky. 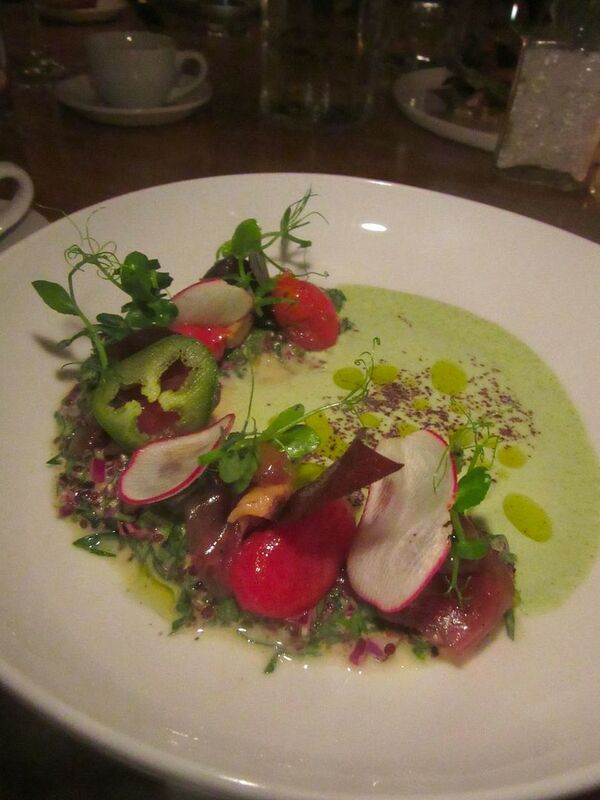 Cured tuna with green tabouli, tzatziki and crispy beet leather meet in this tuna sashimi venture. 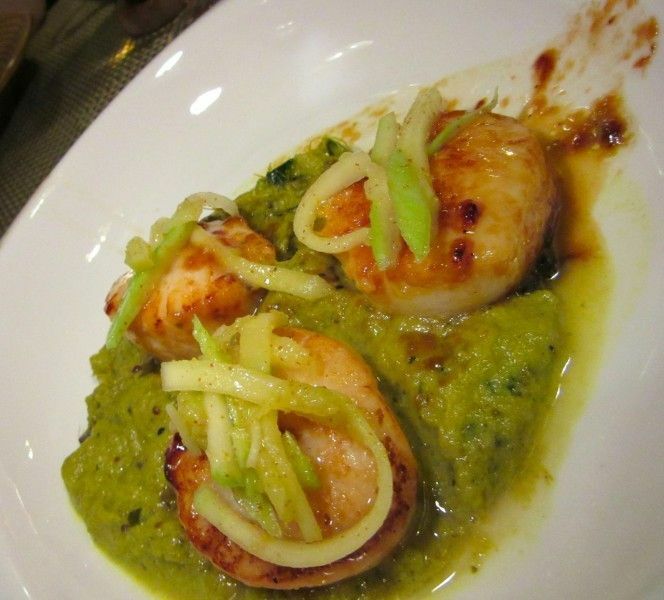 Now dishes of the chef’s very original inventions – a mosaic of Mediterranean, Middle Eastern and North African flavors -- are moving around, clockwise and counter-clockwise, and mostly, they are not only out-of-the-blue, but good. When my pals are distracted by surprises, I quietly order a second flowerpot of bread. The nuttiness of this cauliflower is enhanced by the lush strained yogurt, sumac and lemon. 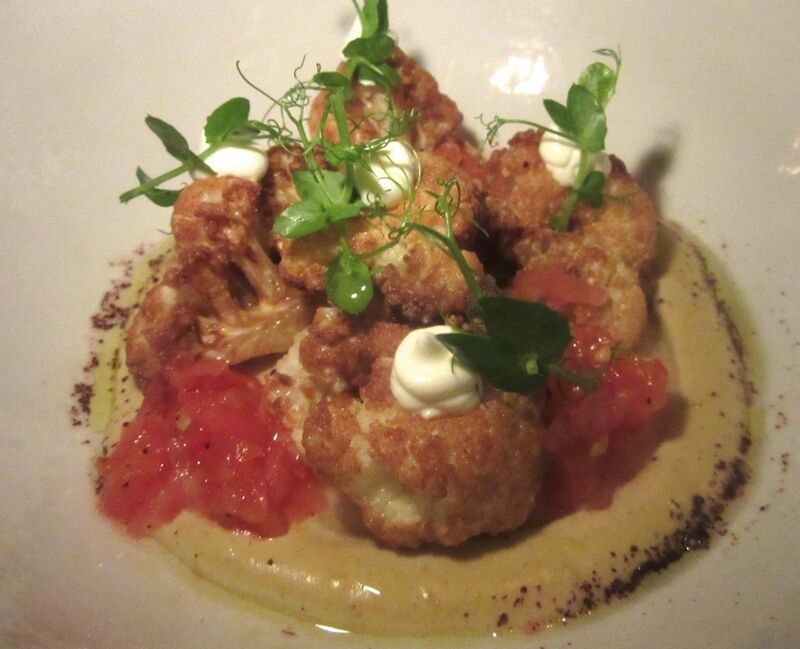 Tendrils of green and plops of rich labneh – strained yogurt the chef makes in-house -- dot the crusty cauliflower. The tahini, I learn, is imported from the Palestinian city of Nablus. 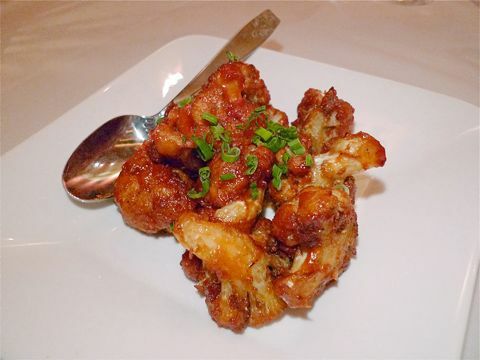 Here on the cauliflower, it’s flavored with curry and sprinkled with sumac. Another complex starter, just $9. 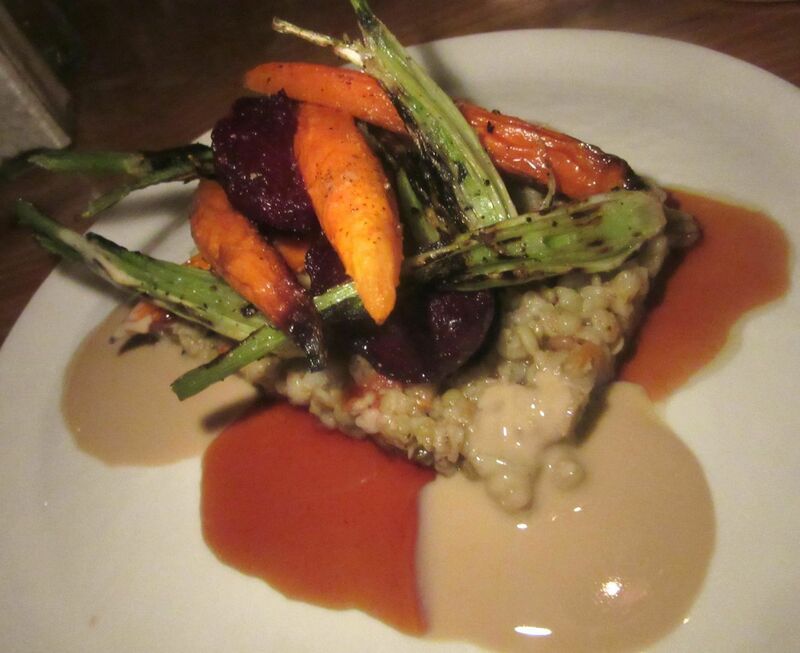 Root vegetable confit is piled atop a warm salad of freekah, an ancient grain that tastes familiar. The ancient grain freekeh is served warm with warm tahini and date molasses in a lovely still life piled with confit’d root vegetables. In the “Mediterranean Sashimi,” cured tuna nestles under peeled tomatoes, sharp green pepper, slices of radish, and beet crisps, arranged like gem stones on a puddle of green tzatziki. As good as it looks. The chef shows his Moroccan heritage in the Casablanca sweetbreads with harissa and grilled baguette. 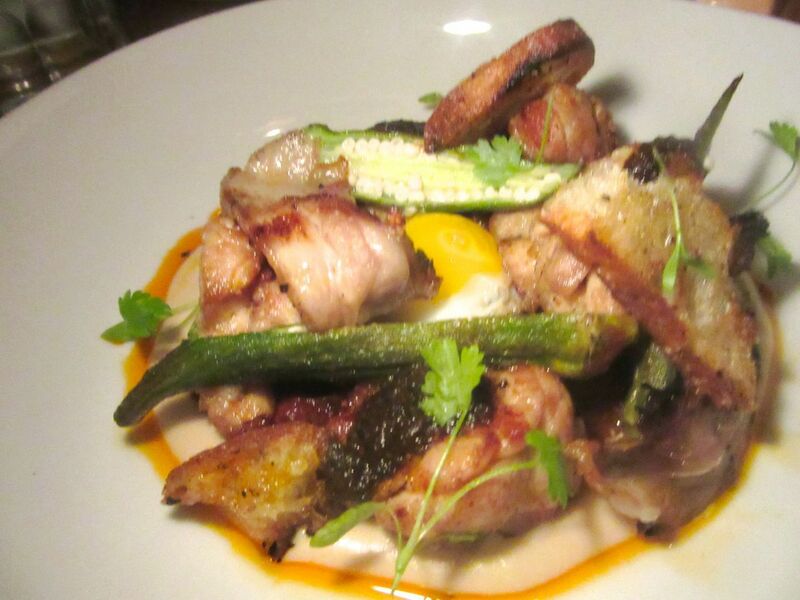 Casablanca sweetbreads, sautéed with slivered okra with an edge of harissa, and topped with a poached quail egg and slices of grilled baguette, evoke the chef’s Moroccan heritage. 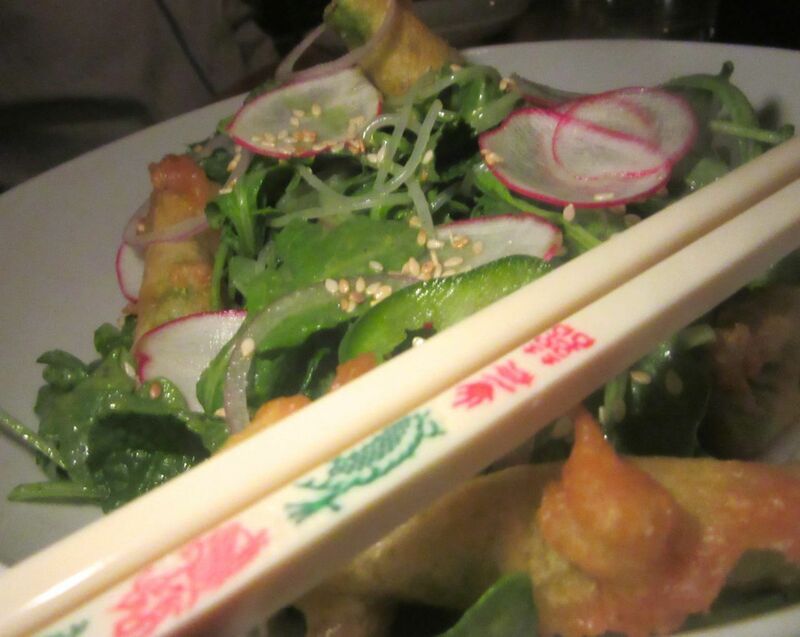 A dish called “Chinatown Summer” comes from another trade route – maybe it’s just Timna’s proximity to Canal Street that inspires a toss of glass noodles with asparagus tempura, ginger-cilantro pesto and baby radish. For us, the waitress delivers a serving spoon, as well as six sets of chopsticks. It’s almost everyone’s favorite. Chinatown summer arrives with chopsticks out-of-left-field but our covey stamp their hearts on it. By the way, our server is exotic too. Fascinated by her accent, the Ethnic Junkie hopes she won’t think him rude if he asks where she was born. Papua New Guinea is her answer. And the accent comes from time in Australia and New Zealand. 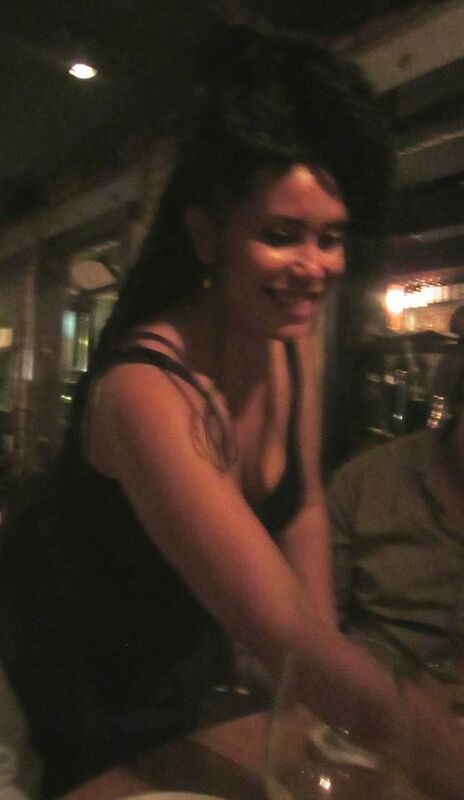 Our server’s elaborate hairdo and accent prompts us to ask where she was born. Papua New Guinea. 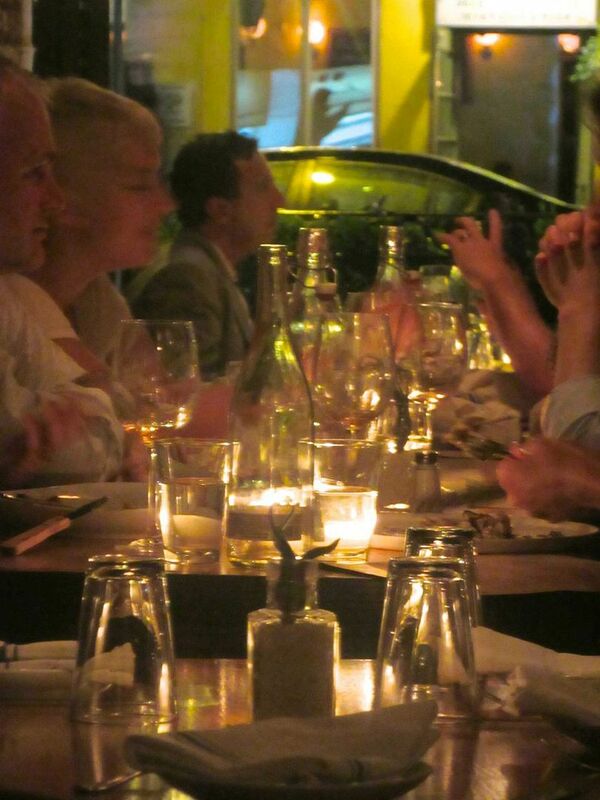 My friends – caught up in ordering more wine -- deputize me to choose entrees or “Plates,” as they’re called on the menu. With so many quirky combinations, it’s hard to decide. I lean toward smoky goat cheese tortellini with sorrel cream, chickpea stew and olive tapenade. And I’m tempted by east-west duck with puffed freekeh and curried aioli. 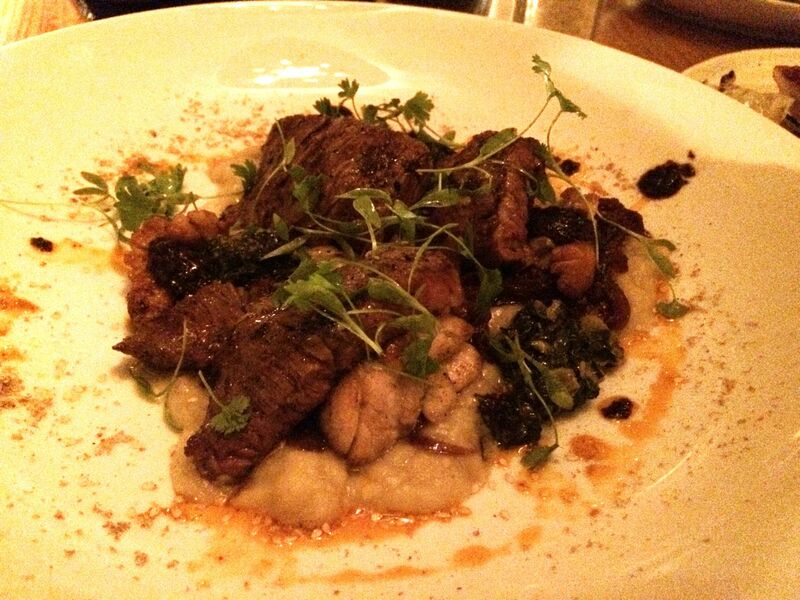 The 1 minute steak comes with sweetbreads and lima beans and an aura of unmami. But the idea of “1 Minute Skirt Steak” wins, along with the lobster pappardelle aglio and olio, with bottarga and a poached and fried egg, although I worry all that could be overkill. Since guess who couldn’t resist the top mound of the ridiculously unnecessary second flowerpot of bread, I’m certainly not hungry. 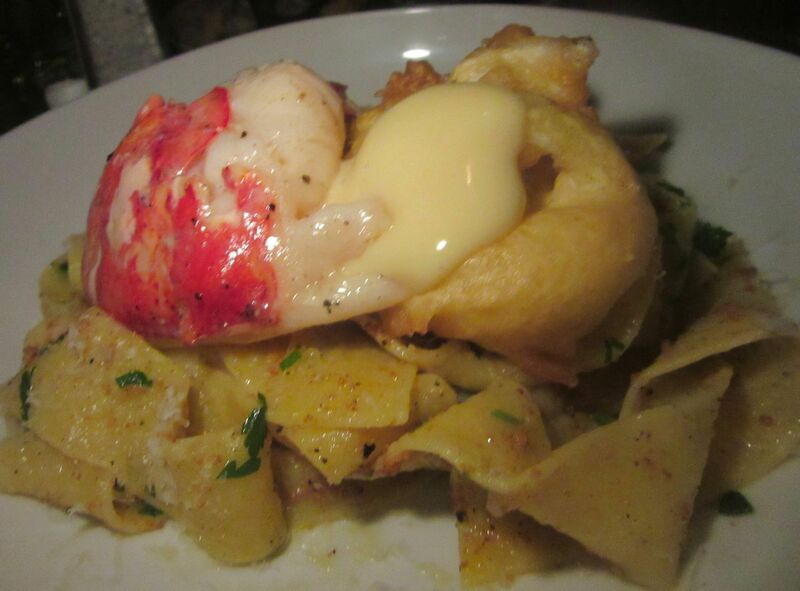 Perhaps the fried egg was too much on the lobster pappardelle with bottarga. Even so, I manage a wide ribbon of pappardelle and a moist dollop of lobster. But the steak plate, with a subtly spicy lima bean purée, is so temptingly rich in umami from both sweetbreads and beef, I find myself taking a taste and then another. Just to be sure I haven’t missed anything. At some point jazz turns into rock and roll, the lights lower, and the place is really full. Our server races around and we sit a while with debris on our tasting plates. As we wait for entrees, the back room has filled and the servers race to keep everyone eating. 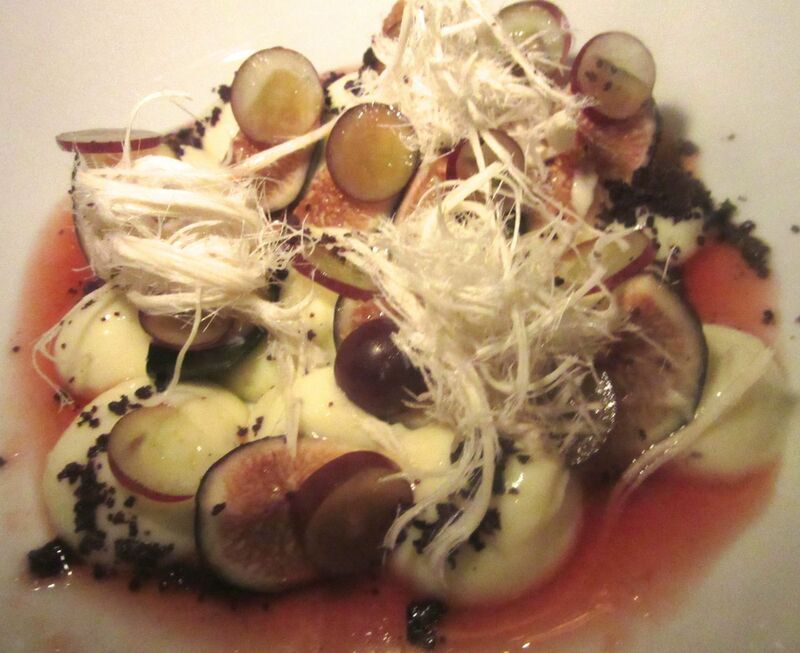 I would never choose fig and olives for dessert, but this odd mix with yuzu crème pâtissière is okay. I can’t say I’m excited about Diane’s choice, "Fig & Olive," as a dessert either, but yuzu crème pâtissière, grapes and homemade fig jam sort of balance dried olives and shredded halva. All you need to know is that this seeming weirdness satisfies a need for closure in six contented adventurers. 109 St. Mark’s Place between First Avenue and Avenue A. 646 964 5181. Tuesday through Thursday, 6 to 11 pm. Friday and Saturday 11:30 am to midnight, Sunday 11:30 am to 10 pm. Closed Monday.